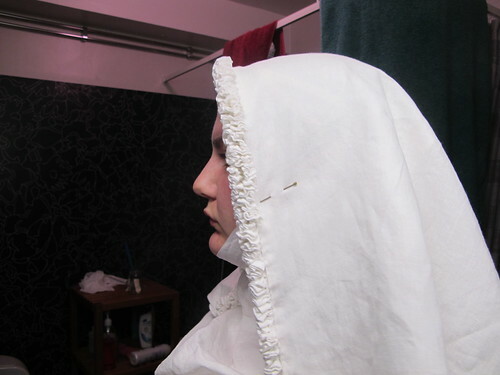 When I saw Elina at Neulakko post about her new frilled veil, and that my veil sparked the idea for it I realized that I have not yet shown mine in close up. It is made out of long strips of linen that are 8cm wide that when hemmed turned out 6cm. I think I had 4 widths of fabric for it, that would make it 6 meters long. 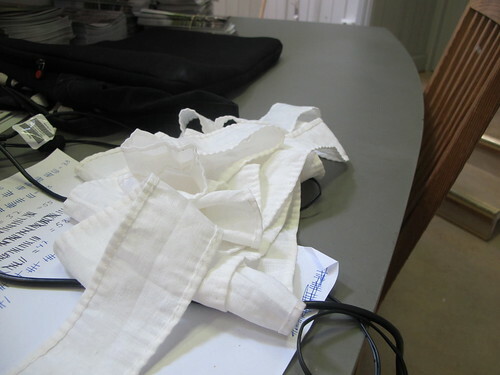 The strips are then sewed together with a very small felled seam, as small as I could manage. Then it was some hemming to do. The linen is medeltidsmode.se thinnest bleached linen, that sadly is not on the webshop at the moment. I hope she gets more of it, it is fantastic so I bought extra much of it last time to have for my summer sewing. Then the strips was folded in half and gathered with two rows of running stitches. I was not really that precise with my stitches. I made sure that the stitches was parallel to each other, but I did not mark out how long they should be. But I tried to make them 1 cm long. 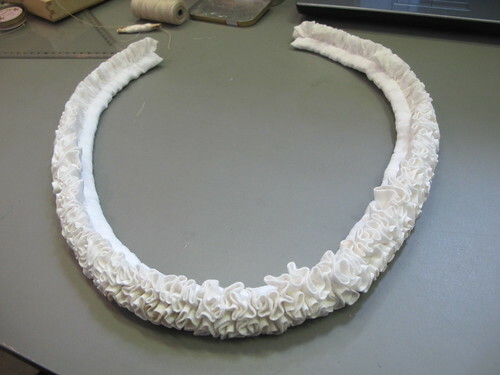 A 1cm stitched gathered tightly gives you a frill that is 0,5 cm thick. I did as my English smocking, and picked just a few threads before the new stitch. Then I secured the treads and enclosed the bottom with a straight on the grain piece of linen, like binding any edge; so that the frills will keep in place. I wanted to make this frill like a separate piece, so that you can just baste it on whatever shape of veil you feel like for the day. 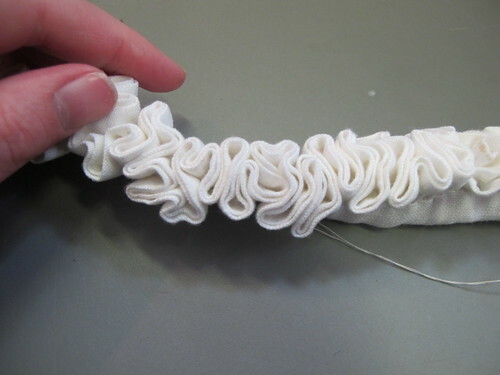 Then I spreaded the frills, the fact that the frills are so short (just 3cm in total, and of that 3 cm only 1,5cm is the frill), and gathered so tightly makes these frills holds up without starching. Even in rainy weather! 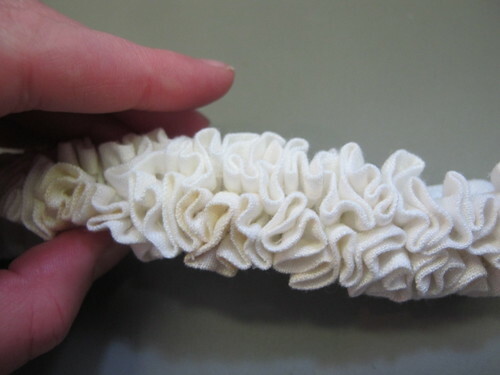 The frill is kind of heavy and falls nicely and holds a nice shape. And here it is on a veil and on me, I like it best with a wimple, and I need just four needles to keep it in place all day, one in the wimple and three in the veil. 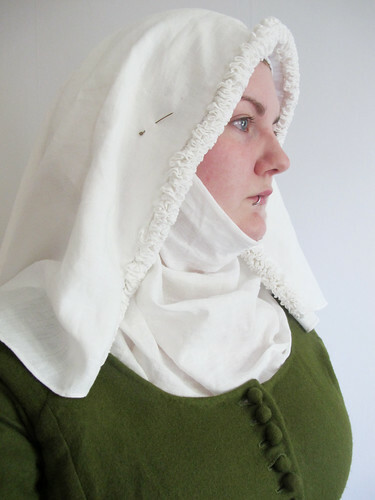 I also wear Birgitta cap under, to pin the veil and wimple on.